Here is an epic fantasy that is full of surprises! Julie Dace is a simple farm girl, tending to her beloved cows in the idyllic valley of Mirsella. But unknown to her, she cares for no ordinary animals! They may be the secret channel through which passes the legendary Gift, a mysterious and forgotton power rarely bestowed upon even the most worthy inhabitants of the valley Here is an epic fantasy that is full of surprises! Julie Dace is a simple farm girl, tending to her beloved cows in the idyllic valley of Mirsella. But unknown to her, she cares for no ordinary animals! They may be the secret channel through which passes the legendary Gift, a mysterious and forgotton power rarely bestowed upon even the most worthy inhabitants of the valley. When the cows confer their precious endowment upon Julie, she is suddenly transported to a strange and distant land. It soon becomes apparent that the Gift may be anything but a blessing. Surrounded by loathesome Wild Tillers and the fleet of pirates known as the Darkmass, Julie senses even more danger in the presence of Prince Andimin - a reckless nobleman who has been driven into exile by his own people. Nevertheless, Andimin gradually assumes the role of Julie's protector. He discerns in her a talent that is far more valuable than his skill with a broadsword, an ability the young woman herself may not recognize. His suspicions are confirmed when he finds the maiden of Mirsella in possession of not one but two of the sacred rarities known as vision-medallions, a mystical creation of the Celadon. And when he invites her to join his little band of followers in a quest to (what else?) save the world, Julie enters into an otherworldly battle rising high above mortal wills, with perils and riddles dwarfing the challenges posed by scythes and crossbows! 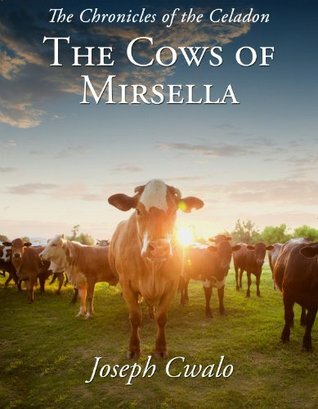 The beginning of a whimsical journey, The Cows of Mirsella represents the first entry in the series The Chronicles of the Celadon.